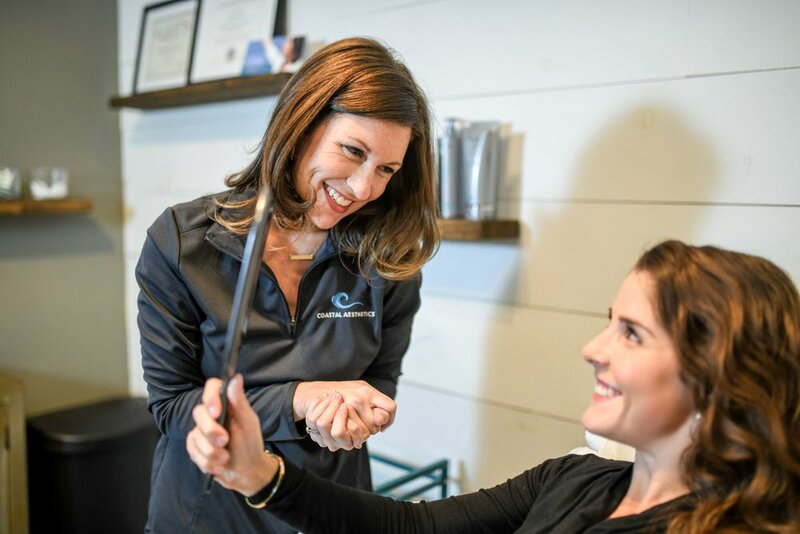 Kimberlee Smith is a Board-Certified Nurse Practitioner by the American Academy of Nurse Practitioners and is the owner of Coastal Aesthetics Medi-Spa. Growing up in coastal York Maine, she chose to open her own practice to be able to provide her clients with a relaxed, inviting, and ultra-conservative environment while receiving top of the line skin rejuvenation and cosmetic treatments. Kimberlee has past experience and training in Urgent Care Medicine and continues to work per diem at Southern Maine Health Care. Kimberlee received training and certification at the National Laser Institute in Boston and received advanced training in cosmetic treatments at the Esthetics Skin Institute. She also received hands on training by a Board-Certified Aesthetic Physician prior to opening her own practice. She is contiunally advancing her education and staying up-to-date on top of the line treatments through advanced training courses. Kimberlee treats each client as an individual and performs treatments based on the needs and desires of her clients. She works with her clients to achieve realistic and appropriate results. She believes in ultra-conservative treatment and shy’s away from unnecessary procedures or over treatment. Rebekah Turner is a Board-Certified Licensed Aesthetician who has been in the skin care industry for 10 + years and received her education and training at Elizabeth Grady School of Esthetics and Massage Therapy in Boston, MA. Rebekah is passionate about educating her clients on how to properly and effectively care and improve the health and appearance of their skin. At each visit Rebekah focuses on her clients skin care goals and individualize needs. Her specialties include facials, waxing, lash and eyebrow tinting, professional grade peels, and dermaplaning. We are beyond thrilled to have her with us and we know you’ll fall in love with her after just one treatment. Coastal Aesthetics Medi-Spa specializes in skin rejuvenation treatments including cosmetic Botox, Juvederm fillers, Kybella, micro-needling, customized chemical peels, facials, waxing, full laser services, eyebrow & eyelash tinting, dermaplaning, Latisse, and SkinCeuticals age-defying skin care products. Our various skin care lines and facial treatments are effective for addressing aging, sun damaged or problematic skin. At Coastal Aesthetics Medi-Spa we perform comprehensive evaluations on all clients and work with you to help create a customized program that fits your individual needs. Let us help you begin your journey towards a healthier and more youthful appearance by combining medical grade treatments with a proper home maintenance program. We look forward to guiding you through this process.